*Editor’s Note* – This is an email sent to me from Jet Ferebee, from North Carolina. He is fighting against the wrongs of wolf introduction in that state. It was labeled as being Part I of a seven-part series. Anxious! This email will be part one of a seven part series in which you and I discern exactly what this canine is and why it is on my farm. I will start out easy. 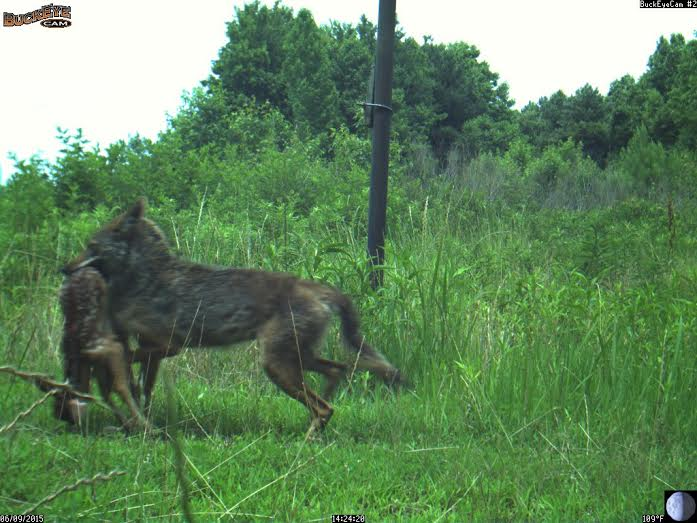 The above picture of a canine on my farm taken last week, speaks volumes about what the USFWS Red Wolf program has brought to and created in our State. As Director of USFWS, can you tell me exactly what this canine is? Is it a coyote, a “red wolf”, a coywolf, or a non-native, invasive USFWS created and tax payer funded hybrid red wolf/coyote? I and many other North Carolinians anxiously await your answer. Please just reply to all ASAP.